Club Penguin Cheats by Mimo777 Club Penguin Cheats by Mimo777: Club Penguin Puffle Party Free Item Cheats! GUESS WHAT MIMO! I WAS AT THE PUFFLE CIRCUS THIHNG AND I WAS A NONMEMBER!I TRYIED GETTING THE JACKET BUT IT KEPT LOADING WAHHHHHH! The Puffle party is the best!!!! I haven't seen an orange puffle yet!!! 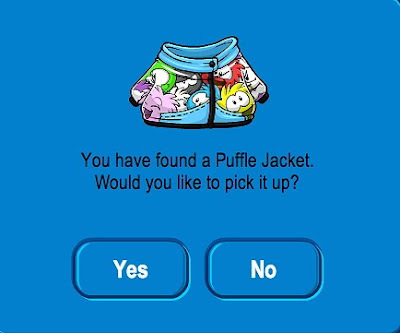 Puffle jacket: puffle member room (at ski village). Cool glitch! sorry you couldn't get the jacket though! :( what'd you think of it? Does anyone know where the orange puffles are? I love the puffle party but this year im a member wooot!!! the Jacket it wicked with the hat its a kool party!!! p.s i love ur site!! Oh, I've been thinking that this was a new kind of party until Jaden58213 said this "GUESS WHAT MIMO! I WAS AT THE PUFFLE CIRCUS THIHNG AND I WAS A NONMEMBER!I TRYIED GETTING THE JACKET BUT IT KEPT LOADING WAHHHHHH!" in the black puffle room (next to the boiler room) there is a button which allows you to close and open the windows. when u close the windows, the black puffles turn into a red flame! Mimo, what server are you on? I'm on Yeti. Hey Mimo! The red puffle room is the cove! Everyone can someone please tell me how to make an account so I can become a cpg mod??? Mimo when becoming a cpg mod can we help you. ___________________________________Good idea! Keep looking (note: if they are in a room they probabably either come every 15 minuts, 30 minutes, or hour. Kepp looking! You don't have to have an account to become a CPG Mod. I'm not sure which account your talking about though. If you want a penguin, go to clubpenguin,com, play now, then press new penguin. and you can make your own penguin. if your talking about google account, underneath the comment box, in the google accoutn section, theres a line that says "No google account? Sign up, here." Click Sign up here to make a google account. With both the items, it makes penguins look like a rainbow penguin! :) Cool free items! Also, who doesn't love CPG? You are right this is spectacular. Hey mimo I would like to say thanks for posting me.I am always staying on this site. Walk a black puffle and go to the plaza and look at the puffle shop sign!The black puffle picture looks evil!I know black puffles can be angry sometimes, but this picture makes him look like he is really angry!angrier than usual! Lol I just saw a black puffle with the crab in the pool! IT WAS cooool even tho i couldnt do it. Orange puffle at ski village! You need 10 orange penguins to see it on the ski lift. Please dont talk in all caps! I guess since this is an early release, CP didn't fix it..... Owwww. Your screaming hurt my ears! Really? I will go check! Maybe Mimo will give you credit if you are right! Ok i need some questions so i can become a cpg mod LET THE QUESTIONING BEGEN. I am sorry to say that Mimo can only meet you if you are a Mimo Mod or above (see Mod Rules to see how you can become a mod) or if you win a contest, and the Prize is to meet Mimo! Sorry! That black puffle... what a character.... I really like the party too! Yes, you are right! I really love this party! I am trying to come up with a closing sentence... how about "Keep on Waddling?" Please respond! Yeah, but remember to only put (CPG MOD) after your name when you are modding.. okay? Thanks! Yeah, me too! I really think that is the room that CP put the most effort into! If you work hard, it will happen! Remember, nothing will be handed to you... well.. maybe a few thing.. Argh! Sorry, Mimo cant meet people unless they are high ranked Mods. It would be unfair. Try going to one of his partys! There really fun! HAPPY FIRST POST! LOL, hope to see you comment more! Thnx for the tip! Oh, well to get the Blue name like mine, I think you have to have a gmail. But to make an account you dont have to have one. If you look at the top it will say something like, sign in or sign up. Click on that, then follow the instructions! But you do have an account. You dont have to have your name be blue to have an account on blogger. You dont have to be a CPG Mod to help Mimo! Just tell him if you see any cheats. If he didnt already know, he will give you credit! Ok here it goes: When was Club penguin first put on the internet? Who is the Secretary General of the United Nations? What do the five Olympic colors mean? When was the first photograph taken? What area is the black-footed ferret indigenous to? WHAT IS UP WITH THAT?!?!?!?!? I can't even LOG IN to Club Penguin. The swirly thing just keeps going, and going, and going, and going, and going, AND THEN, it says INCORRECT PASSWORD when I typed it in right! Aagh! DEFINITELY THE PUFFLE PERFORMANCE ROOM!!!! IT IS SO COOL! You walk up to a stand, puffle grooming chair, or by the start place in the race and if you are walking a puffle it will do that thing! so cool! Posted this some other places but...I need a sign off. I want you guys to come up with some and tell me. I will then pick the best three and we can vote! Thank you. I appreciate it. Hey mimo is there a white puffle room? I've been trying to make a blog like these for days! Mimo doesn't like sharing what servers he's on when he takes pictures, because pictures when he's crowded are kind of a bummer. and we can't see anything, so he is very secret like. You don't need an account to be a CPG Mod, you just comment and put your name in the Name/Url section. If you want you can make a google account, that way you don't have to put your name for every comment, just in the choose identity section under the leave your comment section on this page, go to google account then click sign up here. Good luck Modding! Hope to see you soon! Hmmm. Everyone else seems to be getting on fine, so maybe somethings wrong with your computer? Sorry I haven't been on all day. Church choir practice, tons of HW...ugh! Omg! Getting on CP to check it out! What would I do without you, Mimo?! Sorry to say, but Mimo can't go to his fans' parties. If he went to them, he wouldn't have time to post! Yes. It is in the mine. The orange puffle is by the ski lift. You need 10 orange penguins to see it. A-W-E-S-O-M-E!! I really rocked the party!!! How do you do it in italicized? where is the pink puffle place? You can just go to Name/URL and type in your desired name. URL is optional. Caps lock might be on by accident. Ouch, next time, don't use all caps! Mimo can only meet you if you are a Mimo Mod or higher. Sorry! Wow I didn't know! Great observation Pastrytina! Err anonymous, you just copied and pasted my comment into a comment? I'm not sure if you meant to do that, but please don't do it again. thank you. Server...? Where Mimo took the pix? That was earlier, but Mimo, I would think, would go into not-so-full servers so people don't flock around him and ruin the pix. Easy. CP came out on Oct. 24, 2005. The Secretary General is Ban Ki-moon. Each Olympic country has at least one of these colors in their flag. The first photo was taken in 1826. The black footed ferret is indigenous to North America and to be more specific, the last habitat in 1981 was found in Meeteetse, Wyoming. I don't think Old CPG Mod was that mean. He/she is not a jerk! I'm not trying to be rude, but please keep those certain thoughts to yourself. You wouldn't want to hurt their feelings for giving them a tip! It is at the Ice berg. It is a huge trampoline it rox! ___________________________________I'm sorry, I reviewed the comment and I undestand how you thought i may of been sarcastic but i was not. I wouldnt do that, I understand the commenters intentions, and I said nothing negative about them. I wouldn't say something rude or sarcastic like that :) (thus the smiley face at the end of my comment, I was happy for you telling those who didn't know) I understand you wanted to tell mimo and I appreaciate it (afterall there was alot of questions around where the red puffle would be) Sorry if i sounded sarcastic. I was not sarcastic though. sorry again for your unsatisfaction. Get it? Same with bold just do a B instead of an i! Yeah, there it is. It is in the Mine! It is so cute, it is a small little skating rink! Hmmm...Maybe...nah, um...? Oooh, how about, "Rocking, rolling, and waddling on!" You like? Let me know, and tell the TRUTH! And only put "(ATB a CPG Mod)" when you are Modding, ok? Just wanted to tag onto the end of my last comment "It will not happen again. I hope you understand where i'm coming from, and I want to let you know I wasn't sarcastic. I appreaciate people trying to help CPG and friends out which is what this person was doing :) So sorry, hope I resolved the problem. Maybe there are too many penguins logging on at once. Or, you have the caps-lock on! Remember, passwords are CaSe SeNsItIvE. Are you sure that they were non-members? Maybe they had no clothes on but had that badge you always have when you are a member! I like "Keep on waddling!" Or, maybe--to tie into your name--how about "Toys gone bye-bye!" ...Lol its erm ok but you do whatever you like! 3. 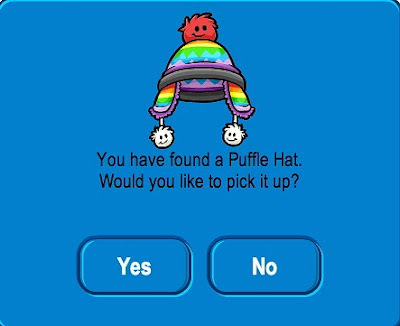 When were puffles first seen on Club Penguin? Sorry Mimo if i have been annoying. And sorry if i been bothering you. Anyways, cool free item! it would look good on 9china9! Yeah, when I got on it took a while. Its either that Club Penguin has trafic(Meaning lots of people are on) Or there is some kind of slow down. Like a bug. Try refreshing the page. Wait a while then try again. Hope you all get on soon! P.S. Still taking suggestions for sign off! mimo guess wat! if you certain puffle- say a green one. bring it to th plaza. congrats! the puffle sign is now the green puffle! now go inside the pet shop. congrats (again) there is a green puffle party in there! Whoa thats awesome, must have been a glitch. But the items members only so there's no way for a non member to get it. puffle show!!!!!! i like that you can see your puffle go up or groom or judge!!!!! Yep it's in the mine. How do you go to the Black Puffle Room? Whoa! Thats awesome but too bad it didnt work and dont type in all caps you are hurting mimo's ears. Unfortunately, mimo cannot come. He is not going to meet anyone individually, no matter what. But you can meet him at a quickee party., a small party that he holds. Yes there is its in the mine. You should check it out. You mean like a google account? If you do you dont need one. All you have to do is copy and paste someones question in the comments. Great observation but mimo already knows this. The free hat has every color puffle and orange!!!! I wonder if that is another clue. I love the white puffle room! I wonder if they will put some of the stuff in from the Puffle Show in Puffle catalogs cause that will be pretty cool interactions with furniture in your igloo am I right? Whats cool is if you take a black Puffle to the obstacle course it will yawn and skip the whole thing. Don't worry! Just keep trying. Mimo is very fast you know. You mean when he took those pictures? If you do hes long gone and he only goes on low servers so theres no crowd. Awesome! I never knew that. Im sure mimo will give you credit. I see you want to become a CPG mod. I do too. There are tons of questions to ask. Just look through the comments. Yeah there is a white puffle room this year! Just head to the mine and you will be stunned. lol. Have fun! That;s cool! But how did you sneaked in? The orange puffle can be seen in the Ski Village, in the Ski Lift. I hate members only room(even though I am a member)Ijust want everyone to go to alll the rooms so they can have fun like members to! P.S If you don't belive im a member,Look for me im Loulou629 and please add me! This is what the post is about. That means Mimo already knows. Mimo at clubpenguin if you go to the snowforts you will find a puffle feeding game its for nonmembers too. Yes, there is! Its in the mine, its like a skating rink, and its really snowy! Those are some awesome new items! I'm glad that CP didn't repeat the black pirate hat again. Does anyone else remember that? Whens the next party mimo?And how many questions do I have to answer to become a mimo mod. Home today! I will probably start modding today! Hi, mimo. Great site for a great game. My fav room is the snow forts. You can hit the puffles with snowballs! I also have a question..would that be animal cruelty!??? haha. Club penguin posted a new blog. Im sorry I went off on you.I just reall y want to be a club penguin gang mod. I don't think it's club penguin changing it b'coz it is there for me and i can see those cool picz. maybe it's your computer. P.S. I don't know if it's ok to write cpg mod for this answer! It is probably just a glitch because CP is improving. I have a brand- new iMac, which is super fast, so it is probably just a bug with CP! I remember that! I really didn't like it, but the people who "rob" the Pizza Parlor seem to think so! The white puffle room is in the Mine and is amazing! Juanita loves it! Yeah, I noticed that. When I was going to play, I accidently hid "French", and it satyed in English! Good Observation! 3. Puffles were first seen when Rockhopper brought along a red puffle found on Rockhopper Island! I read all of the comments regarding this, and honestly, I though Old's Response was innocent. Next time, though, please keep these rude comments to your self... they are hurtful and unpleasent to read! I've searched everywhere, waiting just under 10 minutes in each room, and still haven't found one. the orange puffle can be found at the ski lift, but you need 10 orange penguins for it to appear. Hey Mimo I noticed something. If you go to town you see a big sign saying Puffle Party in different colors. They have every Puffle color except 3. The orange which is coming up and two other ones. Could it be possible that there will be the brown and that darker pink coming up? Why is it always HAT items? For the last.. like 6 months or more it has been hats and hats. Those little guys, only are in the box dimension, ski lodge coo-coo clock (Have to wait 30 mins to see it. )and ski hill and ski lift when you have 10 orange peugnuins. Hope this helped! Ok, since you want to be a mod on CPG, ill ask some club penguin related questions. k? ok... How do you become a Ninja? How many puffle colors have the letter L or R in them? What is the name of the room directly under the Night Club? How many blue penguin colors are there? How many orange penguins do you need to have to see the orange puffle? Lastly, whats the play that won 4 awards in the Club Penguin Play Awards and whats the other play that won 1award? Hope i helped you out! Good luck being a mod! Club penguin is still squishing all those bugs. They were glitches. Hope that helped you on your question! Lol the members are probably all afraid they're like AHHH NON-MEMBER RUN AWAY! (they all go to the opposite side of the as the non-member) "What do we do now?" They all say? The non-member shows a smiley emotion. He's happy! He is dancing in joy then walks over to get the jacket and says "Awww i can't get it!" :( The members are still hiding the in the corner. Then the non-member walks around for a few minutes and eventually leaves. The members cheer. The End. Not sure if you read my reply on your other post. My suggestion is for when you're answering a question "Bumper, Bumping back!" True, perhaps it's another ploy to get penguins to be members "If you become a member, you can get items THAT ARE NOT HATS =0" Xp lol, I don't know, but good point. Hey, i JUST got my hoodie and hat, and i logged out cuz it was goin RILLY slow. When i logged back in, nuttin was in my inventory!! no pins, no colors, nuttin. Plus, when i logged in, this thing pops up and it explains how to walk and stuff, like a tutorial. So, i walked around and notice that everyone was dark blue. everyone said that they were memebers, but they lost ALL their stuffz. just wanted to let ya know bout this glitch. hey! theres a glitch on alpine and if you go your membership will go out and you will turn blue. i lost every thing but than five minutes later i got every thing back! i think it was for the new mission or for the puffle party. any way. manger glitches are going through club penguin. 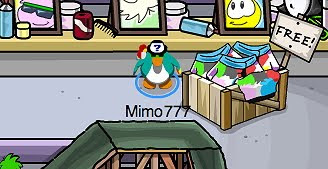 mimo did u see where the puffle feeding is? its in the snow forts next to the clock! u see that path? go there! its a fun game there is a fun game in there! 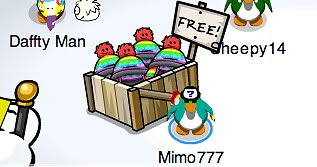 Hey Mimo look at the free hat closly there is a stripe of every puffle colour and theres a orange stripe!! hey mimo, how did you get in there? Ahhh! I am going deaf! Please do not use so many caps! Shoves ice pop in ear... Ahhh.. Better! alot. lol but don't give up and i bet we will see you there. Oh no! Those were perfectly good ice pops! oh well. guess ill have to go back to the ice cream truck and get some for me when people yell. -GalaxyShyft (Takin' the fourms by storm. lol it rhymed. oh, ya and i also forgot about my haiku poem. oops. looks like its in 3rd place. oh well. good enough for me!) TURTLESZ! Please Mimo! Tell us HOW to go to the black puffle room on the next cheat. Thanks.